Sinus lift (or sinus augmentation), is a dentist executed procedure to increase the amount of bone in the molar area of the upper arch in order to prepare it for the insertion of one or more dental implant. Sinus lift is the surgical act that adds bone to the upper jaw bone in the molar and premolar area, in order to render it thicker for implant placement. The bone is added between the jaw and the sinus cavities. When there is a loss of the upper molars the upper sinus cavity starts creeping towards the borders of the jaw bone leaving us with little or no bone for implant insertion. Dr. Turner and his team are now left with the task of lifting the sinus membrane and adding bone substitute thereby increasing the bone volume and enabling implant placement. 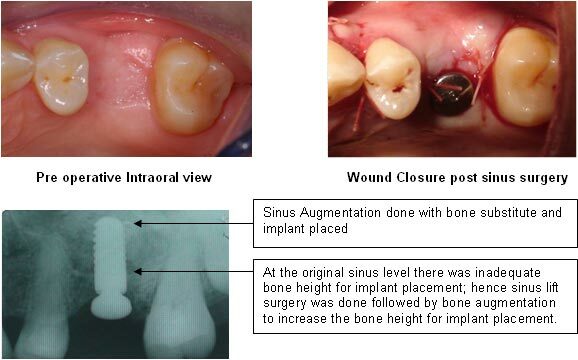 Lots of patients who because of bone loss never had lost hope for implant supported fixed teeth are now benefiting with this predictable and safe method of enhancing bone and improving the quality of our patients lives with fixed teeth solutions.